When your hard drive is “fragmented” all of the Windows system files, programs and personal files you created are scattered all over the hard drive. Think of it as a college dorm room that has not been cleaned in years even though it has had different people living there each year. Junk scattered all over the floor, pizza boxes behind the bed and other items in the room you don’t even recognize. Imagine trying to find a specific item that was lost there a few years back. The search process would be tedious. It would not be easy and it would take a while to find the exact item you are looking for. [adblockingdetector id=”1″]When a computer’s hard drive is disorganized (aka fragmented) it too can take a while to find things. It will take a while to find important Windows system and program files that load when Windows starts. It will take a while to open certain programs or files while you are using the computer, compared to how fast it was when the computer was new. This is where defragmenting (aka organizing) your hard disk drive files on a regular basis will come in handy. Defragmenting your hard drive will increase its efficiency in finding files thus increasing the speed of your overall Windows computer, especially the first time you do it. The first time you defragment your computer it will take a while, maybe as much as 6 hours. In this case I recommend defragging your computer right before you leave to work or school, maybe leave your computer on overnight while it is being defragmented. For those of you who have been following this site for at least a year you may remember a program called “JKDefrag” that I recommended and created a tutorial on how-to defrag your PC using it. 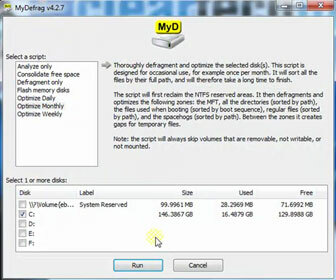 MyDefrag is just the newer version of JKDefrag with a better name and easier to remember website. Not much has changed from JKDefrag to MyDefrag. I created a tutorial for the new version anyway to make sure all of the new readers are up to speed on the defragmentation process of a PC hard drive.